The Japanese built this station in 1897. Oddly, this was just two years after Taiwan was ceded to them, which shows how important monitoring the weather in the new territory must have been to those in charge. In the first few years of colonization, stations were built in Taipei, Taichung, Tainan, Hengchun, and Penghu. 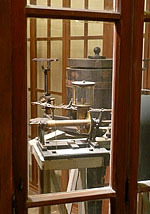 The first station was built in Taipei. The building in Tainan was the second one built and it is the only one of the five remaining. Not only is it the only one of its era left in Taiwan, but there are no other remaining from this period in Japan either. 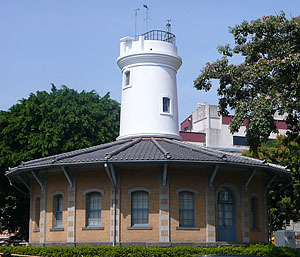 The location of the Tainan Meteorological Station was chosen because it had the highest elevation in the city at the time. Perhaps it still is the highest point, though that’s all academic in a city as flat as Tainan. Oh, the hill you must climb! The round structure of the building follows three concentric circles with offices on the outside, tower access on the inside, and a circular hallway running between them. The top of the tower contains the exterior instruments. For a long time the building remained unused except for storage. 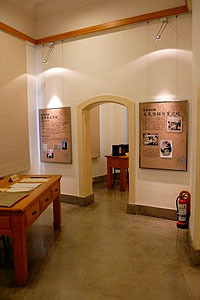 Recently, the interior of the building has been renovated and opened to the public as a museum. It is not a large space and there is only a little on display, but you can check out the inside free of charge. The display conatains some old instruments including the seismograph that was in use from the 1930s through the 60s. All of the information is in Chinese only. The large, white, modern building to the left of the station is the Southern Region Weather Center. It is a functional outlet of Taiwan’s Central Weather Bureau, but also functions as an education and public outreach center. Its lobby also has meteorological displays open to the public. 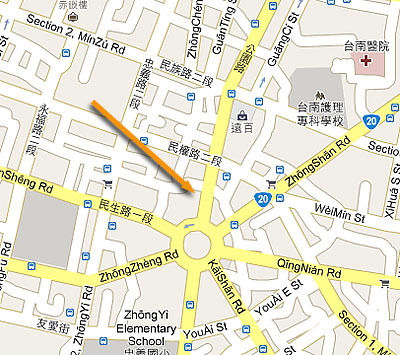 Oh yes we should go there next time we go to Taiwan, there is a great turkey and fried rice restaurant across the road and that the very old and good zongzi restaurant we went to in Minquan Rd just around the corner! Taiwanese won’t often miss a chance to bring food into the equation.